The major cities of Eastern Europe make perfect travel destinations. Marked by history, evolving with the times, the major cities of Eastern Europe offer sites, shopping, food, entertainment, and more. Formerly the capital of Yugoslavia, Belgrade now serves as the capital of the independent nation of Serbia. Belgrade is a destination that has yet to be discovered by the average tourist, so visitors to Belgrade can expect an authentic experience. A relatively new Eastern European capital city, Bratislava has a strong musical heritage. Bratislava is also conveniently located for traveling to other European cities. A center of industry, Brno is a major Czech city that is known as the capital of Moravia. This major city hosts many festivals, including music and dance festivals, and is home to the creepy and popular Capuchin Crypt and Monastery. Bucharest is Romania's capital city. A folk museum may be of particular interest to visitors, but the theater, as well as restaurants featuring traditional cuisine may be enjoyed as well. Budapest's restaurants, especially those featuring traditional Hungarian cuisine, will please visitor's to Hungary's capital. The city also has its fair share of museums and architecture, which can be followed by a trip to one of the city's famous thermal baths. Ukraine's capital city, Kiev, has a long history. Once the administrative center of ancient Rus, it is also the location in which Orthodoxy was chosen as the religion of the Slavs. Evidence of this historic event can be seen in the city's St. Sofia Cathedral. Krakow is one of Poland's top destination cities and a great jump-off point to exploring southern Poland. Krakow is easy to get from Warsaw by train if you want to visit both cities while you're in Poland. Krasnoyarsk, a Siberian city, has plenty of shopping, museums, and curiosities. Known as a "city of fountains," Krasnoyarsk is a charming stop on the Trans-Siberian railway. Slovenia's capital city, Ljubljana, has a walkable historic district with picturesque bridges and statues. Learn about the legends that surround Ljubljana, and its river, the Ljubljanica, as you explore the city's sites. Russia's huge capital city is expanding, and its rising prices put a strain on even its residents. However, the visitor to Moscow can find plenty to do that won't command luxury prices. Visiting the Kremlin, seeing Lenin's body, or visiting one of its parks or museums will cost little or nothing beyond the cost of transportation. Pecs, a major city in the southern part of Hungary, is a location full of history, culture, tradition, and art. See early Christian ruins or attend one of Pecs' festivals. Plovdiv, a major city in Bulgaria, features Roman ruins, historical architecture, art, and shopping. You can easily reach Plovdiv from Bulgaria's capital city, Sofia. Prague, the Capital City of Czech Republic, is known for its beauty, nightlife, shopping venues, and Old Town. Visit castles, museums, and homes of famous individuals. Visit Old Town Square to see the famous Astronomical Clock. Prague is a major Eastern European city that can't be missed! Riga has been called "The Paris of the Baltics." Riga is also the capital city of Latvia and the largest city in the Baltic region. Samara is located on a bend on the Volga River, which has given it a distinct advantage over the course of its development. One of Russia's largest cities, Samara is an important industrial and cultural center. St. Petersburg, Peter the Great's "Window to the West," was, at one time, Russias capital city. With eye-catching architecture, palaces-turned-museums, and miles of bridges and canals, St. Petersburg is considered by some the most beautiful city in Russia. Tallinn is a fascinating city to visit with its interplay of sense of history with the super-modern. Estonia expresses a sense of itself in this attractive capital city; a tour of its old town, castle hill, and surrounding area will reveal landmarks signifying important events in Estonia's history. Tirana's long history means that visitors will have plenty of sightseeing to keep them busy in this capital city. Sights include fortresses and castles, churches and mosques, and monuments and museums. Tomsk is located in Siberia and is recognized for its many centers of learning. Tomsk is also famous for its wooden architecture. Vilnius is a city of surprises. One of the Baltic capitals, its large old town area is easy and enjoyable to explore on foot. Its Neoclassical cathedral square is guarded by a medieval castle tower that offers views of the largely Baroque historic core. When you visit, find a city where religions and ethnicities meet and centuries of history make themselves know. 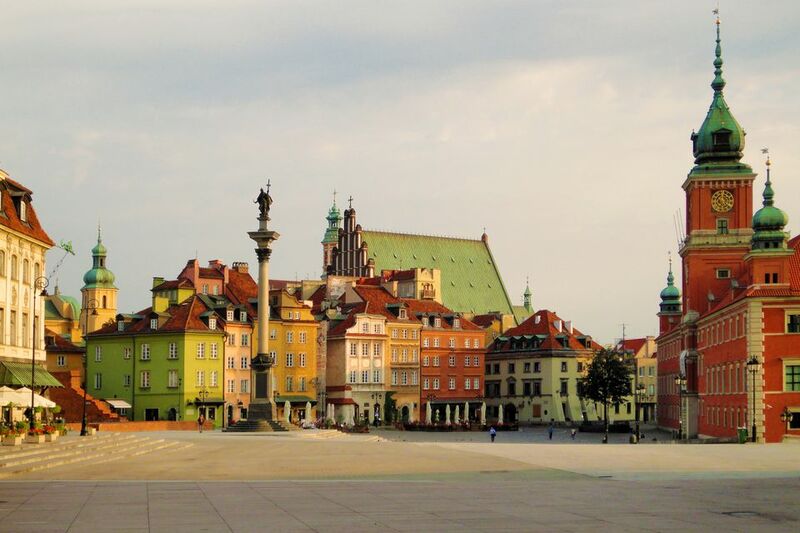 Warsaw, the capital city of Poland, is a city with a particular history. After much of it was destroyed by war during the last century, the city was rebuilt. Some structures that you see today have been rebuilt using bricks taken from older, ruined buildings. Wroclaw is the capital of the Silesian region of Poland. Its multi-ethnic population means the city exhibits a wide array of influences. Visitors love to hunt for Wroclaw's dwarfs.